A while ago I wrote about my Aunt Dolly’s autograph book, a book that I had looked through many times as a child, pondering over the small painting and pencil sketches and wondering who had taken the time to write within its pages. 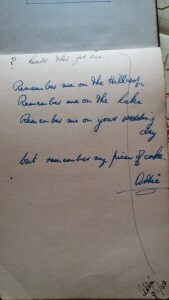 While looking through my ‘stuff’, mainly photographs, I found my mum’s autograph book. Many of Aunt Dolly’s entrants had been nurses at Stanley Royd, family and friends, mum’s was different and at the moment it seems fitting to write about the people in Lizzie Riach’s little black book, as the other day it was 70 years since the war ended in Europe and most of the writers in the little book are members of the forces. Wouldn’t it be nice for a relative to find their entry now, years, many years later! Or what would be even better, would be for someone who wrote their little dittie to see it – and wouldn’t it be fantastic if they remembered my mum! Opening the book, Jimmy (James 427), in March 1943, also wants the privilege of being first. 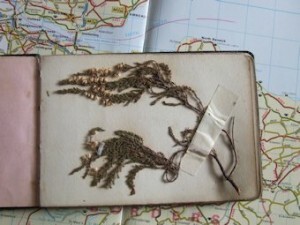 The following page has two twigs of white heather still sticking to the page by their original tape. Eve Cook, writes simply ‘ To one of the nicest girls I’ve known, Best always’, she goes on to say ‘not so primitive as I sound’. What did that mean? Obviously, it meant something to Eve and my mum. ‘To Ann, wishing you all the happiness you deserve – for they who look only for the best in everyone they meet are too rare’ . Neville Sibley, Dunearn House, 26 Jan. ’43. 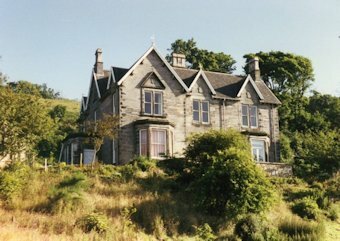 Who was Neville and where is or was Dunearn House? That was an easy one, a quick google, and there it was! I know it is the correct one, Dundearn House, Burntisland, as mum served in the A.T.S. at Burntisland during WWII. 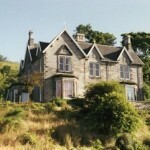 Now to answer the question ‘Was Dunearn House a billet during the war or did it have some other purpose. No drawing, no little dittie or simple sentiment, just a name – Clark D L, O.F.C., 501 Hy. AA bty, Donibristle Point, 19/4/1943. And so back to Google maps to find that Donibristle is just inland from Burntisland, but where Donibristle Point is, Google is keeping that a secret! ‘In the parlour there were three. Ann, the parlour lamp and he. Two’s company without a doubt. So the parlour light went out’. Nan Cunningham penned that on 17th January 1943. ‘What do we live for if it is not to make life less difficult to each other. In your golden chain of friendship, regard me as a link’. W Blackwood, A.T.S., who is she? Could she be called Winifred? The next few words are from Audrey Kettle, H.P.C., Notts (mum was also posted there and it was there that she met her future husband). What Audrey wrote, although then, was meant in all innocence and probably is featured on many pages, in 100’s of autograph books, the wording in this politically correct culture, would be taken in the wrong context by a few. But needless to say, Audrey’s words made me smile – all based on the sound of words and a space in the right place! A google search brought up the Burma Star Association website telling me that HPC was Home Postal Service. An earlier entry for J M that gave nothing away as to who J M was now, further in the book, ‘a lonely spot’, they now tell they are at Arlands (? 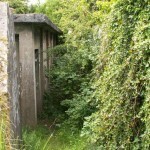 ), Fochabers. Later in the book I may find out a little more. Back south of the border to Nottingham and Joan (A.T.S.). ‘Happy memories of the “Vic” at Nottingham’. What memories, what happened at the Vic, that mum and Joan shared in 1944? Was the ‘Vic’ a theatre, was it a pub, one this is for sure it is not a shopping centre. birds flutter and drink from a birth bath. 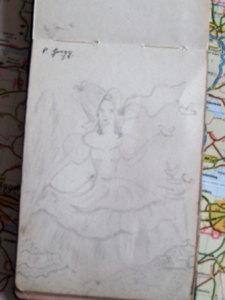 The artist is P Gregg – who was she, I am presuming a lady drew this. It is sad that modern technology has done away with the autograph book, as within the pages, filled with words, poems, all written in different styles of writing………making the book very personal to the writer and the owner of the book……many memories held within those pages. S D Williamson, 2 Forest Crescent, Thornton, Fife writes ‘Health, Happiness and the Best of Luck, where every you may be….. Mac’. Looking again at the page – the name and address are in a different pen and a different hand. Conclusion……..they are two people, Mac and S D Williams of Fife. Now another question…..who is Mac? Still only about half way through and Sig med, Rita, A.T.S, on 17th of January 1943, writes ‘ Down the street there walked a peach. Who was both pretty and fair. A stealthy look, a half closed eye, and the Peach, became a Pair’. Another page with two entries, this time both from men. ‘We’ll miss you at camp, Ann. how much, we only know, but your, smile, your wink in our memories lingers, where-ever you go’ A starred Romeo………..D Watson. At the foot of the page and just managing to say ‘Wishing you all the best of Love……Josh, Wot no Kisses’. Frank Smith writes ‘Thank God for girls like you Ann. I shall miss your happy smile, and with you all you wish yourself, where-ever you may go’. ‘Long may you live! Long may you love! and long may you be happy’. 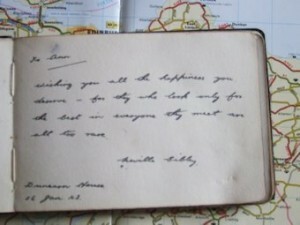 S W Lewis wrote on the now faded and blotched page on 19th of January 1943. 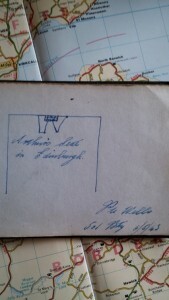 Every autograph book has ‘Roses are red, violets are blue, honey is sweet and so are you’, this time written by E Aitken of 11 Manse Avenue, Whitburn, West Lothian. The next entry came as quite a surprise, well not the wording but who had written the words. Firstly, the entry……….’Life is but a great hotel, a hand shake and our au-revoir. We’ll meet again if all is well. When we have passed the open door’. Now who wrote the words. They were written by a man who would have had to travel many miles – John Wilson, Gladstone, Queensland, 5.11.45. As to whether John was in the services, I have no idea, but it would be nice to know if he made it back to Gladstone. ‘Women darn their husbands socks, with never ceasing care. But when they get a whole in theirs, they buy another pair’. So true, and written by Irvin Skelton(? ), 501 Bty, R.A., Blantyne Farm Camp, 24 May 1943. Turning over the faded yellow page Joan Hemingway, A.T.S. wrote ‘Ann now, Ann ever, Riach now but not for ever. This book I see in later years, I wonder what your name will be’. On the 6th of May 1945, Helen F Caldie, A.T.S., H.P.C., R.E., Wittingham, wrote about friendship being a chain that is never broken. 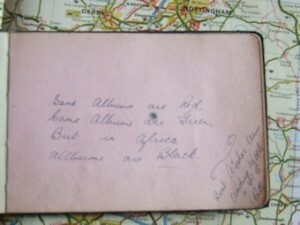 A greeting from A Hepburn, (42 Land S***d), Kirklands, Fochabers, written in a pen that seems to have had better days! While Len, thanks Ann, for the letters she brought and her smiling happy face that added to the happiness contained within the envelopes from home. The 24th of February 1946, two young men named Joe and Ted, wrote ‘Remember the Paiaise, Nottingham that afternoon? We kept the ‘Poles’ up alright didn’t we!!!‘. Also on the same page, but tucked into a corner, Mary wished Ann, her old pal, all the best. Barbara, signing herself (Lady) Barbara, wrote ‘I wish I had someone to love me. Someone to call me his own. Someone to buy me chocolate. As I’m sick of buying my own!’. Barbara writes from Craigend, Bathgate, West Lothian on 23rd Jan 1943. 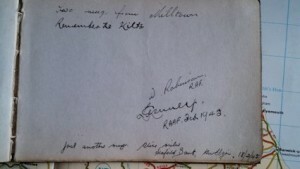 Other entries are from J Mathieson, 69 Mid Street, Keith and G Newton Burntisisland, 16 January 1943. Turning the faded pink page, Val Peek, A.T.S., wrote on 18 January 1946, ‘Very best of luck from a ‘little’ Cockney girl’. Well at least we have a clue as to where Val originated from. Another entry is written by S Frost, West Melton, on 26 October 1945. A little saucy poem follows ‘Ann, had a little lamb, she also had a bear. I’ve often seen her little lamb, but never seen her bare!’ ‘Wishing you all you wish yourself, Rita M Cromrie, 24 February 1946’. Doesn’t the English language make you chuckle at how two words pronounced the same can mean something totally different, and so many autograph books have similar entries. 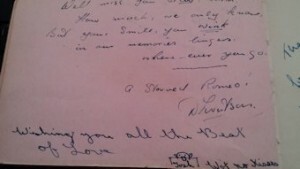 Signaller Rita Walker penned her effort on 17th of January 1943, while over the page, Frae Rosie Vernon of the A.T.S., wrote about roses being red. No poem, no greeting came from the next page but details that looked as though they should be on an envelope – Pte D.Abbott, A.T.S., 501 (M) Bty R.A., Woodend Camp, Helensburgh. An entry on one of the faded yellow pages is from A.E. Walker, ex-trooper. Written on an angle in very small writing and in Italian (?) and using Google translator for one word, I think that A.E. 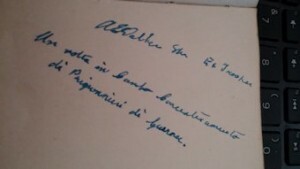 Walker wrote the following ‘Un notta in Campo Concentraimento di Prigioanieri de Guerra’ – something about a prisoner of war camp, possibly. Joan Bradshaw and Mary Wilkinson, both serving with the A.T.S., wrote on 9th June 1943 – Mary having two entries back to back. Mac or Mal Pearson B.H.Q., wrote ‘A little bit of powder, a little bit of paint. Makes the ladies faces, really what they ain’t’, on 14 May 1943. I get the feeling that how the verse is worded that Mal or Mac was a soldier. M Jamieson, Seaview, Kingston-on-Spey, wrote another little dittie with a play on words, ‘ A tablespoon is rather large, a teaspoon rather small. But a spoon upon the sofa, is the best spoon of all’. 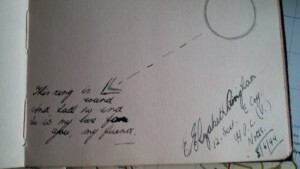 While Pte., Emilia Race, A.T.S, on 6 May 1943 wrote the words to the well known Vera Lynn song, We’ll meet again. A simple one liner ‘ Two mugs from Milltown, remember the kilts!’ was written by D Robinson, R.A.F., and what could be L Kenneth R.A.A.F. Feb 1945, followed very quickly by ‘Just another mug, Alice Milne, Seafield Bank, New Elgin, 18 February 1945′. what she’s knittin’ ain’t for Britain!’ Another cheeky little poem from ‘Daisy’ Day, 8th May 1943. Getting close to the final pages, Joy Wood W.A.A.F., C.R.S., Nottingham, on 11 November 1946, wrote her own poem and apologised for the ‘shocking poetry’. J Cumberland, C.R.S., January 11th 1946. 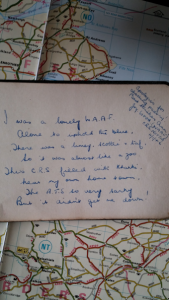 A rather bold entry from W.A.A.F., Jean Brown of Lossiemouth was written on 20 June 1943, while on 8th of August, 1944, Joan Demers wrote ‘ Sincerest wishes always Ann! Remember Just 1 of Room 5, 5 Carrisbrook’. I wonder what that meant? Entries by Gladys Rowberry and E Freeman, are followed by ‘I’d lie for you my darling, in thrilling tones she cried. She was brunette. He preferred blonde, and so the damsel dyed’. Yet another play on words by Mitch, who wishes Ann, all the best in Civvy Street. E Elizabeth Bingham, 12 Sect. E. Coy., H.P.C. (V), Notts., wrote on 5 June 1944 – the day before D-Day – ‘This ring is round and hath no end, so is my love for you, my friend. The Bridle Pie, by Peggy Innes is the next entry ‘Take a cup of kindliness, a tablespoon of trust. Add a pinch of confidence. Roll out a loving crust. Flour with contentment and keep free from strife. Fill with understanding and bake well for life’. Followed by Doris E Wells on 16th January 1945. Urquhart and to her family she was Lizzie. In the army, to her husband and friends in Yorkshire she was Ann. Oh!, how I would have loved to know the smiling, fun loving woman written about so fondly in her little black book. 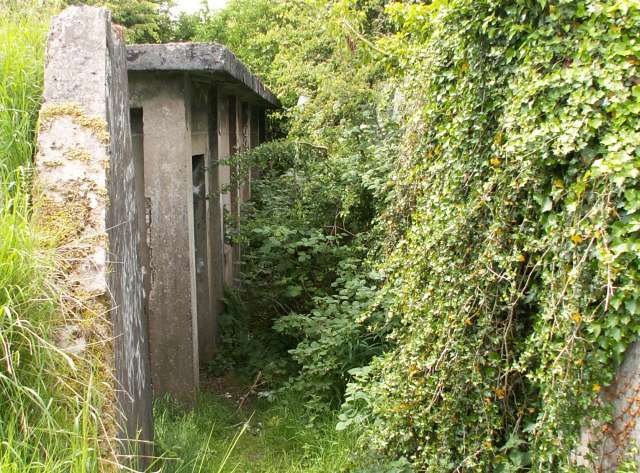 This entry was posted in General and tagged Ack Ack, Armed Service, Army, ATS, Bathgate, Blantyne Farm Camp, Burntisland, campaign, Carrisbrook, casualty, conflict, Craigend, Donibristle, Elgin, family, Fife, Fochabers, France, gun emplacements, History, HPC, Kingston-on-Spey, Lossiemouth, memory, military, Milltown, Morayshire, names, New Elgin, Nottingham, Nottinghamshire, photographs, RAAF, RAF, Seafield Bank, Seaview, transcription, War, West Lothian, West Melton, Woodend Camp, World War 2, yorkshire on May 17, 2015 by carol.